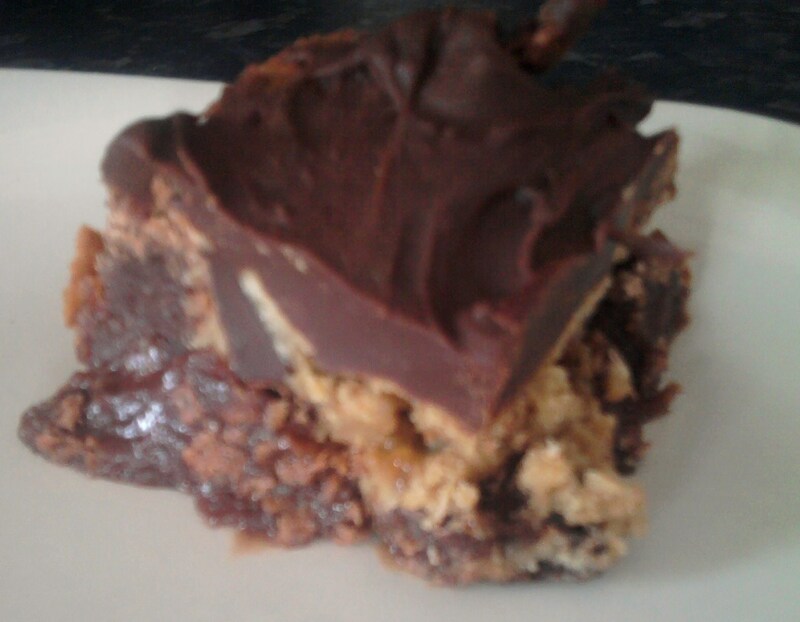 So I've had an idea for a while now to make a desert that is about 1000 calories a slice. 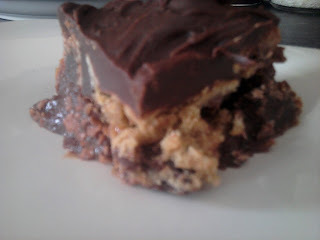 I saw somewhere about brownie and cookie dough squares and I thought, that's a little too healthy for me. Why not add some chocolate fudge sauce on top? You know, go the whole hog? Now I have to warn you, I gave a small piece to my three year old and she had a tiny bite and then requested some milk. She had to have a large glug of milk after every small bite and was immobilized for a while after. My husband took some into work and gave it out in the morning and everyone needed a nap and couldn't work. It's just that stodgy. Just a little warning before I give you the recipe. With great power comes great responsibility. This makes two cakes (about 8 inches, I make one 10 inch cake and a loaf tin one). Make two quantities of the brownie recipe found here, but leave out the chocolate chunks. Split the mixture between the two tins and bake for 20 mins till firm-ish but not fully baked. Set to one side till cooled in tin. Mix all the ingredients together and spread a covering over the brownie base. Bake for about 10 mins and allow to cool completely. OH myyyyy! This is something that will be made in my house soon! This is an absolutely perfect recipe. I know, however, that I would eat too much and be rendered comatose for the rest of the day. Also if you're interested in doing a guest post I would LOVE that too!! Oh. My. These look divine! I have such a horrible sweet tooth! HAVE MERCY!!!!! That is a keeper for sure!! We all love you for sharing this! This looks so delicious! I haven't had breakfast yet, would it be bad if I just made this and ate it? Hey Rhiannon!!! I loved this recipe and when I ate it, it was amazing but all i could think about in my head was " calorie, calorie, calorie!" But I couldn't stop eating! Hahahahahahahaha! Wow! These look so yummy - I'm defo going to make these. Finally something for the boy!